We Be Reading: "Lucy Armitage wheeled her bicycle round to the yard at the back of Rosewood Antiques ..."
"Lucy Armitage wheeled her bicycle round to the yard at the back of Rosewood Antiques ..."
I've been trying to choose more books from my own unread piles recently and the other day I was in the mood to grab Rookhurst Hall by Elizabeth Jeffrey. Set in both 1960s England and flashbacks to the World Wars, this is a brief novel about love and loss. Lucy Armitage is a secretary in 1960, coping with the recent departure of her less than affectionate mother who has gone to Australia with her new husband. Lucy is finding joy in her independence but also struggling with building meaningful and trusting relationships. She lives above an antique shop run by the kind Alec Manton and his son Ben. When Alec returns a writing bureau to Lucy that he has just finished restoring for her, he also hands over two photos that he found in a hidden compartment. Much to her surprise, Ben recognizes one of the photos as Rookhurst Hall, a place he has been invited more than once to appraise antiques. Even stranger though is what they recognize in the early twentieth century photograph of three sisters -- Lucy's own face. Lucy then sets out on a journey to the past where she will find out more about her own family and also the one that lived in Rookhurst Hall. Though I barely liked Lucy at the best times, the first-person narration of the past by a woman named Alice was a heartbreaking and compelling story that made reading this book really worth it. The discussions of the serving class, the World Wars and the flu epidemic were interesting and well-researched. 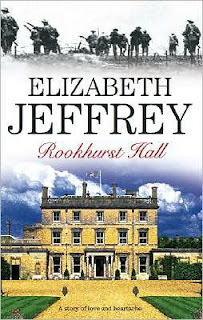 Has anyone else read any novels by Elizabeth Jeffrey? This one doesn't appear to have much visibility and her other ones don't seem to be regularly available in the U.S. but I'm going to make an effort to find some of her other novels because they look interesting as well. Support our site and buy Rookhurst Hall on Amazon or find it at your local library. We bought our own copy. Hey Subhashini! first time here. 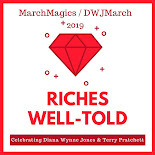 Nice to land on a fellow booklovers blog! My library gets a lot of these books published by Severn House and this is one I've looked at. I had heard nothing about it, so it's one I didn't pick up, but now you've made me curious about it. The setting sounds like something I'd like. And I need to read more from my own stacks as well. The premise sounds pretty neat. But I've never heard of her ... but I almost never hear of the books or authors you read! I will forgive a lot of flaws in books about the World Wars and the flu epidemic. Particularly if they are set in England. I've never heard of Elizabeth Jeffrey before this review. Danielle - I don't think I've noticed anything from Severn House before. I can't even recall where I heard about this one. It might have been an Amazon recommendation. Paige - You probably have better access to her books because I think they're published in the UK. Jenny - I will too. There's so much to learn from novels like this!